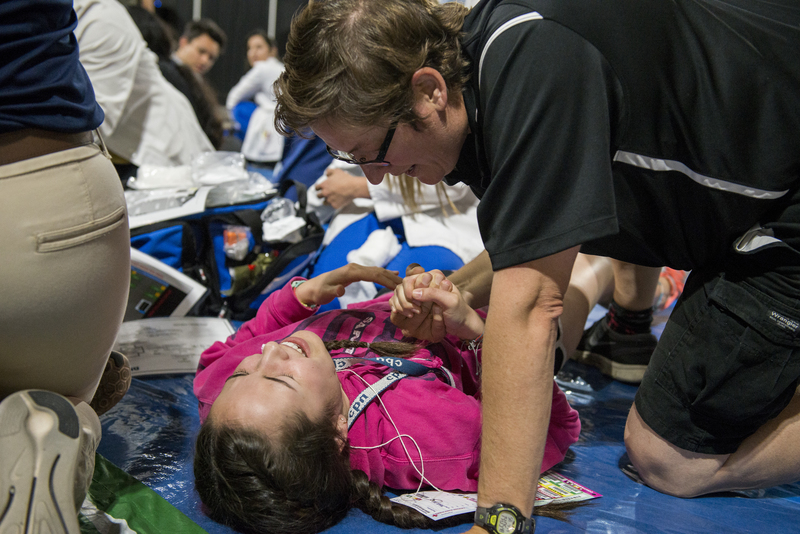 Among the shrieks, screams and calls for help in a disaster situation, a healthcare professional must stay level-headed to provide the most effective aid to victims. 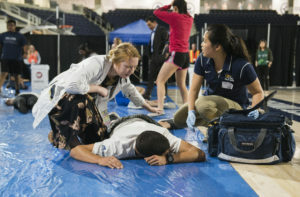 The School of Nursing at California Baptist University hosted an active-shooter simulation April 14 to prepare healthcare graduate students for real-life crisis situations. 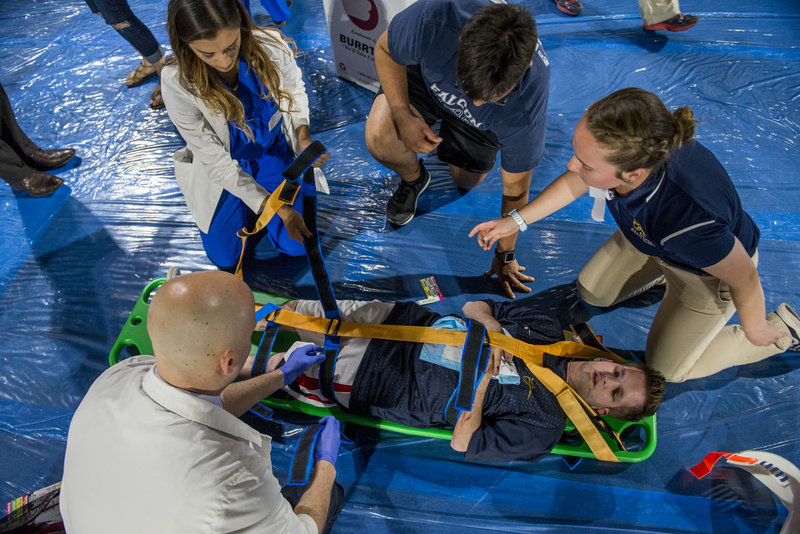 Nurse practitioners, physician assistants, athletic trainers, speech language pathologists, behavioral health sciences and public health graduate students all participated in the simulation. 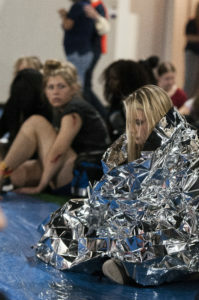 Before entering the Events Center, graduate students were briefed that there had been a simulated mass shooting at a CBU volleyball game and that fans were exposed to anthrax. CBU graduate students were expected to collaborate with one another to provide disaster relief to victims. “As nurse practitioners, we are triaging patients and checking if they need immediate attention and making sure our resources go to the appropriate patients that need response first,” said Genevieve Monge, nurse practitioner graduate student. Each victim in the simulation wore a triage identification card around his or her neck identifying the medical condition of the “patient” so the healthcare students could note assessment of injuries. Patients were sent to one of four triage tarps set up in the simulation: green, yellow, red or black. Patients that could wait for treatment were sent to the green tarp, then patients needing attention would be sent to the yellow or red tarp depending on severity. The black tarp represented those who had died in the simulatuon attack. Ryan Lehfeldt, junior film studies major, was one of the actors who “died” during the simulation. He works on campus as a standardized patient in the School of Nursing and off campus as an actor. Lehfeldt said he was inspired to participate as an actor in the simulation to have an impact on the healthcare students preparing to serve their community. The disaster relief situation lasted for 40 minutes, completing Phase 1 of the simulation. In the debriefing session, public health, behavioral science and speech language pathologist students were able to take the lead in developing a community family plan to recovery. 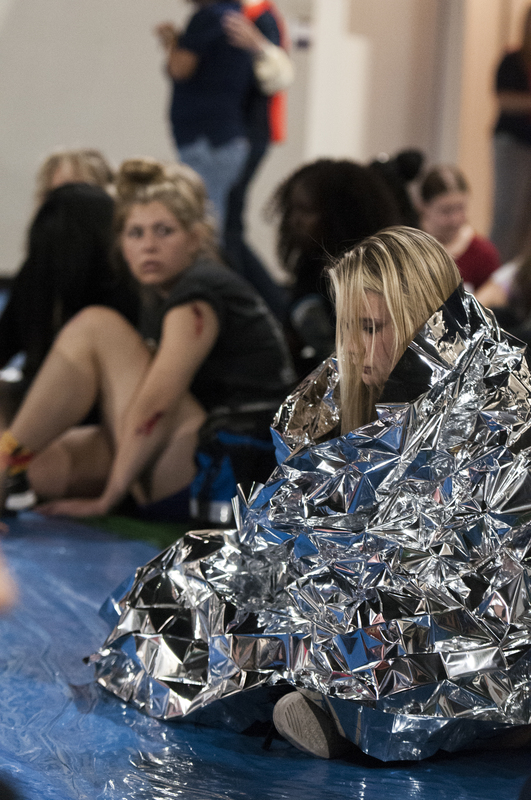 “We want (the students) to have compassion and empathy, and realize that after all of this is over, there is still a lot of damage to be repaired,” said Dr. Dayna Herrera, department chair of inter-professional education (IPE) in the CBU School of Nursing. Herrera took the lead on planning this simulation. 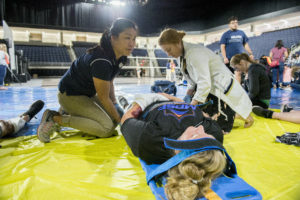 It was designed to promote inter-professional collaboration between graduate students and is the third and final course of required IPE curriculum for CBU healthcare graduate students. “The university is doing a fantastic job at training us, preparing us for real-life and (teaching us) how to think through chaotic situations methodically,” Monge said. This is the second year the university has hosted the disaster simulation and more than 400 actors, students and faculty participated. “This is definitely a very valuable experience. (The simulation) is definitely getting much larger, more organized and more like real-life each time,” Monge said. 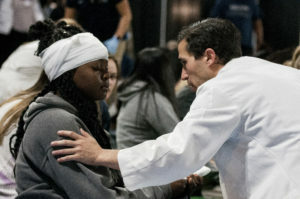 Next year, the simulation is projected to expand and incorporate social work and emergency medical technician programs.